The phortse Team was made up of 6 members. Click on a person in the Photo to find out more about them. A railway maintenance engineer living in Derby, and the team's indefatigable leader. She enjoyed her experiences on a 3 month expedition to Guyana so much that she decided to join Himalayan Hands to help with the planning of the project. Zena's leadership skills got us all over some very big hills, while her caring manner met the needs of being the teams chief first aider. A mechanical engineer working for a railway consultancy in Derby. As well as being the group photographer and second first aider, Ian‘s keenness extends to carrying extra weight in his rucksack, for "training"! He was often seen balanced precariously near the edge of steep cliffs, "just trying to get the perfect shot". A maintenance engineer at Interfleet Technology, based in Derby. Married to John, Helen was keen to get away from it all. Sadly, John went too! Helen's high altitude double glazing was one of the marvels of the Everest valley. A mechanical engineer for Interfleet Technology in Derby. As an expert DIYer and general handyman, John looked after all issues to do with work and design at the school. John's artistic talents also came in very handy with expedition artwork including impromptu posters. Adele was in a minority to start with, as a researcher for the NHS based in Oxford, she isn't an engineer. However, her dry Yorkshire sense of humour and self-proclaimed title of "irreverence officer" soon meant we were all working as a team. She left her husband Ollie to fend for himself and their two children, Calum and Ffion whilst we were in Nepal. A nurse working in Oxford, she has dreamed of trekking in Nepal - a dream which came true in November. Sadly Hannah pulled out of the project after spending an exhausting 7 weeks in Nepal before the expedition. An IT consultant living in Birmingham. Having undertaken a short expedition to Guyana in 1997, he was keen to suffer the hardships of another developing country. Sadly Woolfie was unable to join us due to changing job circumstances. Raj joined the team in Kathmandu as one of the many local students supplied to Himalayan Hands by SPW. 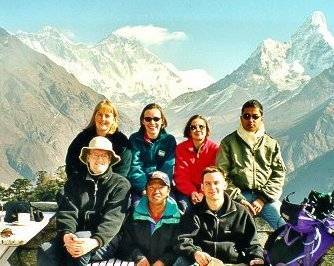 Raj was invaluable as an interpreter, guide and friend during and since the expedition. Raj's ability to run up high altitude passes as if he was strolling down to the shops gained him the title "trainee sherpa". Raj is currently a student in London. Panuru our Guide was an honoree member of the team. He stayed with us throughout our time in the mountains, both trekking and working in the village. Having climbed Everest three times, the trek up to Gokyo was just a stroll in the park for Panuru.